When this house was filled with the choas of four kids, I longed for just a few hours of uninterupted time. I would relish the one and only day of the year when Brian would take the kids out of town Christmas shopping, I would have this entire house to myself. The possiblities of what I would do for those few brief hours kept me excited for weeks. I've never done 'Quiet' very well or very often. Noise & activity & multi-tasking have been engrained in me for so long, that there simply hasn't been room for Quiet. Even as the house emptied and I've found myself with more hours of Potential Quiet than I ever expected possible, I still fill my space and head with activity and noise in abundance. And when all else fails, I create events to keep it at bay. I'm working at learning to come to terms with 'Quiet'. I've turned off the TV, the radio, my books - for entire hours at a time. I an actually coming to like it. I've even done something that I have always considered absolutely IMPOSSIBLE. I have been driving the car with no sound. Amazing! I did't even know that it would work with the radio Off. For the past few days, he's been away & it's just been Abby and Me. You'd think, that I would be delighted & excited to have a few days of uninterupted time to play and create all day AND night - not having to cook or dung off the table for dinner. You'd think that I'd get wonderful things accomplished. It's not happening. I kind of walk around in circles, wondering what I should do, where I should start, what I could accomplish. Turns out, it's Too Quiet. And too Solitary. It's not helping my creative process one little bit. Abby's just chillin'. She's pretty happy in her quiet little Dog World. Me ... l'll be real glad when Brian gets home tomorrow and I can go back to wondering how I can to squeeze just a Little Bit of Quiet into the day. Anyone who finds winter long, should arrange to go to a Creativity Retreat. If you can't find one, MAKE one. Rent a place, gather up some creative friends and watch the space be filled with energy, inspiration and motivation. Last week, I headed off to the Finger Lakes region in Up State New York to be with a group of wonderful ladies from Canada & the USA at the 'International Creativity Retreat'. Just like our one in Orangeville in January, we did nothing but PLAY, day and night. It gives you something to look forward to, something to enjoy and something to warm your heart and make you smile, long after it's over. Valentine's Day weekend - a wonderful time for wedding. It couldn't have been a more perfect day - sunshine, no wind - outstandingly beautiful for February. I was honoured to be the photographer, documenting the beginning of a new journey for a very special couple. They're heading off in the morning, to another province to make their home. I worked all weekend to get over a thousand images to them, so that they can take moments of the magical weekend with them. It's pretty cool to get to be the 'eyes' that capture such an important event. Honoured indeed. Sure enough ... the snow has all gone and my little babbling brook is a raging river in just two days. BUT ... it IS just February and it IS Southwestern Ontario - the heart of the Snow Belt ... so another 48 hours and we could be back to shovelling. I'd vote for snow over mud though - MUCH prettier. I have one biological Sister - she is Beyond Awesome. I SO love her. There's just the two of us left in our family of nine - it's been like that for quite awhile. If our family would be all here with us, we'd have three sisters and three brothers and that would have been ever so cool. But there are just the two of us & neither of us takes that for granted. I'm so lucky that she lives real close - at any given moment, we can sit over a cup of tea and talk for hours. I have some adopted Sisters and they too are Beyond Awesome. I SO love them. Wonderful women who have come into my life over the years, who have nestled down into my heart every bit as comfortably and naturally as any biological Sister could. An unfortunate accident has put one of my sweet Sisters in the hospital with a broken back. Besides the special bond of friendship, we are Sisters in Creativity - a small group of amazing women who get together monthy to inspire & motivate and basically entertain each other & keep each other sane. One of my other dear Sisters from the group & I went to the hospital yesterday to be with our friend. The time we spend together, no matter when, no matter where, calls for a cup of tea. A GOOD cup of tea. A lukewarm cup of water with a plastic lid and teabag on the side, does not qualify at ANY time, especially not for a Sisterhood Visit. I packed up my electric kettle, some real mugs and a selection of specialty teas. which is also most essential. We drew the curtains, put on the kettle and made a decent cup of tea. The three of us sitting there with our Real Cuppa', laughing and getting excited about art & colours & fabrics & techniques - for a while it seemed that we completely forgot about where we were and why. 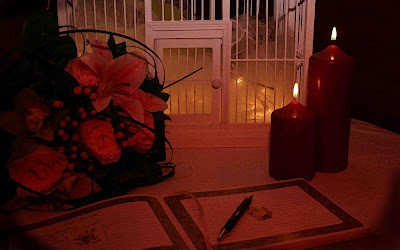 We created our own little world of Sisterhood and Tea behind the closed curtains and that was enough to brighten the day and tuck it into our hearts as a warm and happy memory. Not what is seen in mirrors. With Friends and Talk and Tea. I would add - no matter WHERE, no matter WHEN. I'm not sure when it happened - I used to absolutely HATE winter. I had myself all riled up every fall, just with the fact that it was coming. Every year, I'd hope that it somehow would FORGET to arrive. I would grumble long and loud, from the first snowflake to the last. Somewhere along the line, I've not only come to accept Winter, I've come to embrace it. While everyone is complaining that our winter here has been TOO long, TOO cold, TOO much snow - it hasn't bothered me a bit. I've grown content to take the day as it is, knowing that the clock is spinning so fast that not only will summer be here before we know it, but winter will have returned as well. I love the fresh, clean covering of snow, softly blanketing the earth as it sleeps. I love the golden glow and the shadows that are cast by a winter sunset. I love the fact that darkness comes early and the nights are long, allowing me to do quiet things that I wouldn't do on a summer night. Wood stove crackling, I cuddle up with my blanket and cup of tea - maybe reading a novel or gathering up seeds of inspiration from wonderful creative magazines ... maybe working on my crazy quilting that I'm doing for no other reason than it seems like a good Winter Thing to do. On Friday night, I came in our laneway as the sun was slipping away. The snow by the brook looked so soft & gentle & peaceful, it was hard to not wish that winter would stay with us a bit longer. I took the time to get out of the car and take a picture to capture that moment, knowing that winter can indeed slip away quickly, even though it sometimes seems it doesn't. Sure enough, by morning it was totally different. Spring is in the air already - the consistency of the snow has changed - patches of grass are showing through already and we can see our driveway for the first time in three months. All too soon, I will put my quiet evening pastimes away and be trying to squeeze every last ounce of sunlight out of the day. And that will be fine too. I love quotes - been collecting them for decades. I love photography - been taking pictures for just as long. One of the projects that I'm working on is to put the two together. This one speaks to me of Rumi's quote: "Sell your cleverness and purchase bewilderment." Bewildered I am. 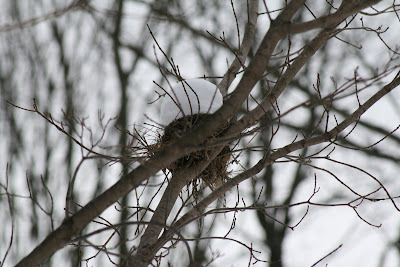 How did that snowball get WAY up there in that bird's nest. It's so round, so perfect, so balanced. Did a bird build it up there? Did someone throw it up there? Did it start as a tiny speck and build up over the season? Perhaps the Angels were having a snowball fight. PS. You can see where the snowball nest is exactly, in the photo of the place we stayed at the retreat ... look to the left, right above the picnic table.